Since 2011, 52 construction workers fell to their death in New York City. 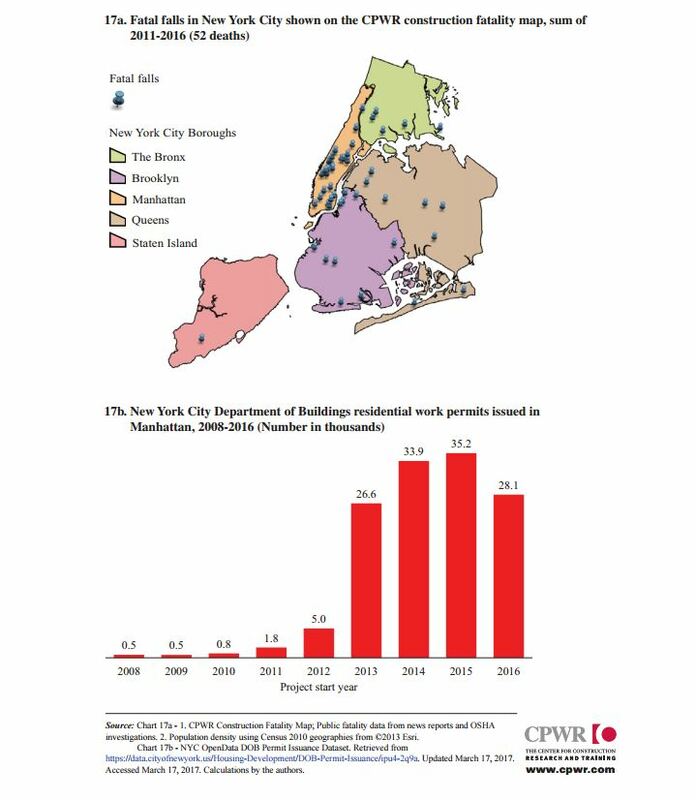 In its recently published First Quarter Report, the Center for Construction Research and Training (CPWR) is highlighting how the surge in work permits over the last few years is correlated to the high number of fatal falls especially in Manhattan. New York City is not the only location affected by a rise in fall fatalities. All over the U.S. as the economy picked up, more construction workers lost their lives on the job. According to recent statistics, 985 construction workers died in 2015. Among them 367 fell to their death. Ahead of the 4th Annual National Stand-Down to prevent falls in the construction industry, the CPWR decided to focus its 2017 first quarter report solely on fatal and non fatal falls in the construction industry. The report illustrates how economic ups and downs since the beginning of 2000 affected employment in the construction industry. It points out the higher volatility in employment for Hispanic workers As of last year Hispanic workers were representing 30% of the construction workers population while in 2003 when the economy was slower they were representing 2.1%. The number of fatalities in construction sites is also highly correlated to the pace of the economy with the number of fall fatalities usually rising faster during an economic recovery. Again Hispanic workers are the most at risk of dying in a fall on a construction site. A very interesting part of the report looks at data from the “Census of Fatal Occupational Injuries (CFOI)” that analyzes the height of falls. One might think that most fatal fall occur from great heights. However data collected since 2011 demonstrates that while falls from more than 30 feet resulted in a little bit more than 20% of all fatal deaths, more than half of them occur from 20 feet or less. Between 2011 and 2015, 1,533 construction workers fell to their death to a lower level. Among them, 33% fell from a roof, 24% fell from a ladder and 15% from scaffolds. Roofers are the most at risks of a fatal fall to a lower level. 332 of these workers were working in the roofing industry, 225 were working in residential building and 124 were doing painting and wall covering. Hispanic workers are the most at risk of dying when falling to a lower level. The report also covers falls that were not deadly but that resulted in injury for the worker. People working in retail have a higher risk of getting injured while falling than construction workers. According to statistics, among workers who suffered personal injury after falling on the job, 31,220 were working in the retail industry, 23,860 in the construction industry, 23,510 in manufacturing and 22,910 in transportation. The two largest trades in the construction industry,construction laborers and carpenters, recorded the most injuries from slips, trips and falls in 2015. However while looking at the rate of fall injuries, helper and power-line installer are the most at risk of getting injured in a fall. Most fall accidents are preventable therefore fall prevention is key in reducing the number of construction workers dying or suffering injury from falls. OSHA, requires that contractors and employers protect their employees and provide them with specific safety equipment, training and supervision. Unfortunately OSHA standards are violated daily by greedy employers who put profit ahead of safety. Additionally resources allocated to OSHA are so limited that it is impossible for OSHA inspectors to cover all construction sites. Therefore campaigns like the National Stand Down for fall safety that will start next week are essential to develop awareness about preventing deaths and injuries related to fatal falls in the construction industry.